This afternoon at TechCrunch Disrupt SF, Sonar announced that they’d added in what is likely their userbase’s most requested feature: LinkedIn support. Launched just months ago at Disrupt NY, Sonar taps into your existing social network accounts and your current location to find potential connections between you and those around you. 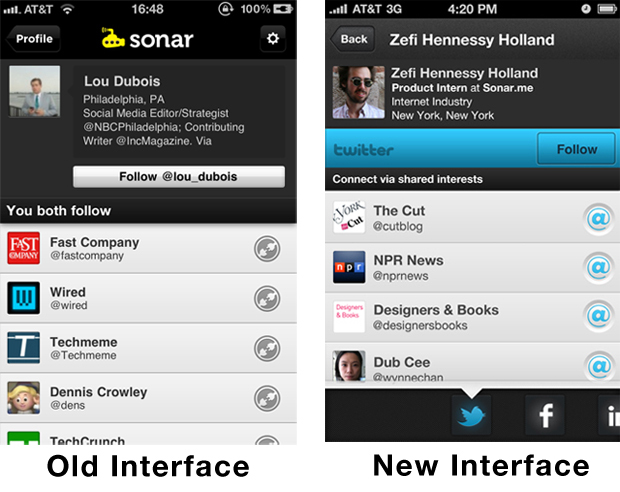 Up until now, Sonar supported only Facebook, Twitter, and Foursquare, inherently lending it more of a social, friend-making vibe. With this newest addition, Sonar is moving to become more of the professional network-building tool that people expect it to be. Sonar also debuted a new interface for their app, and disclosed details for the gift package they’re planning to give all new hires. Spoiler alert: the package is absolutely ridiculous. The new interface is primarily aimed at addressing the feedback they’ve seen thus far. They’ve prettied it up considerably (adding splashes of color throughout), streamlined the signup process, and have built-in a fancy new carousel that lets you peruse connections from each supported social network with just a quick swipe separating them. To be clear, they’re not asking new hires to pick one or two things they want — they confirmed with me multiple times that all new hires (they plan to make a few) will get all of the stuff above. Ridiculous. So, why the heck would they do this? “We’d rather spend the money on this stuff then on recruiters”, says founder Brett Martin. I wondered if this was a cleverly obfuscated way of getting new talent without offering equity, but Brett assured me that this in no way takes equity negotiations off the table.